When Huang Fu Song attacks another player and they use an escape, Huang Fu Song can then duel that player. When Huang Fu Song does not have a weapon equipped, he has an attacking range of three. 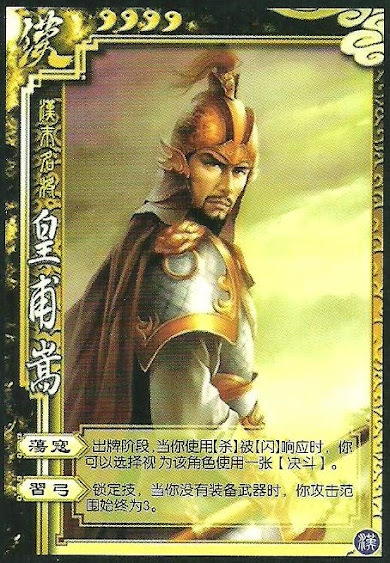 Huang Fu Song does not need to player a card to duel someone using "Bandit Assault". He just decides if he wants to. When using "Bandit Assault", it is treated as if Huang Fu Song had played a Duel. This means that the target will have to play the first Attack. Huang Fu Song can use equipped horses in conjunction with "Bowmanship" to further increase his range.